The All-New Fiesta has definitely been one to watch this year, with its clever technology, beautiful design and futuristic safety features; there is no doubt why many have chosen this car above the rest. It’s these features as well as the smoothness of the vehicle why Dan, a fully qualified Driving Instructor recently starting out on his own, decided the Fiesta was the right vehicle for him. Early on in November, we had the pleasure of handing over to him the All-New Fiesta on a rather dull and cold morning. However, the Fiesta still stood out and looked stunning, the excellent design work by Rock Solid Graphics & Print only added to the vehicle. We sat down with Dan to ask him a few questions about himself, his All-New Fiesta, and whether he had any funny stories to tell us about his time as a driving instructor. I am 35yrs old and married with a son, I have been an hydraulics engineer since I was 19, driving all over the east and London. I have always been into cars since I learnt to drive, I am in car a club and love taking my car to shows. I started my training in October 2015 which consisted of three parts 1. theory test 2. driving test 3. instructor exam with about 40 hours of training with the AA driving school. When I qualified I took out a franchise with the AA driving school to get myself started. I found that I got most of my pupils through social media and word of mouth and it got to the point that I did not need the AA for pupils so decided that it was best for me to go independent. 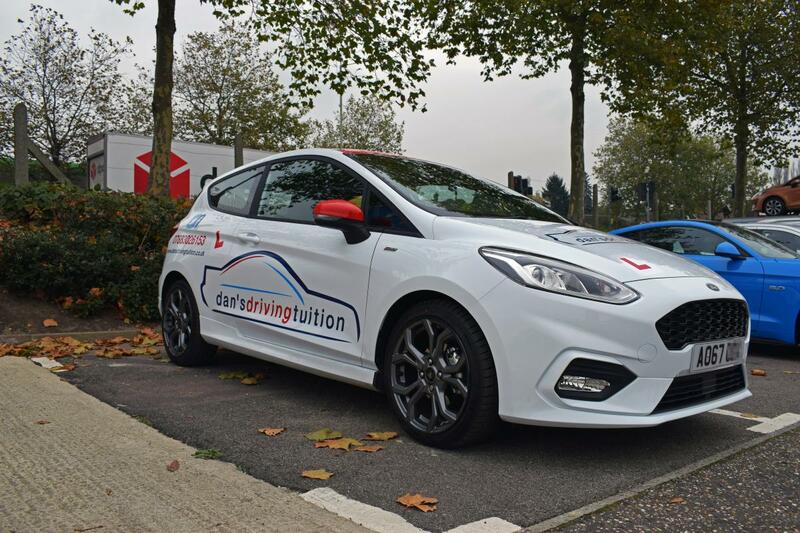 You’ve recently gone independent as a driving instructor, why did you choose the Fiesta as your vehicle of choice? With the AA I had a mk7 fiesta and it was a really nice car to teach in and an easy car to drive, so when I was looking to go independent I was aware of the mk8 fiesta coming out, so I went and had a look at the options of leasing a car. I had a look at the car and managed to have a test drive and it was a such a different car to drive than the mk7 , a lot smoother and very comfy. As I was going to advertise myself I went for the ST line to stand out. Any funny stories/experiences whilst teaching people to drive? I don’t really have any funny stories but since becoming a driving instructor I notice how bad some drivers on the road are and it’s quite scary some times.